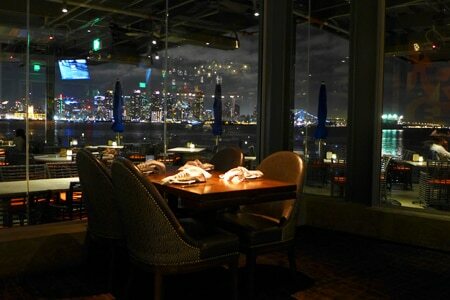 Upscale Mexican cuisine served in a stunning waterfront location on San Diego's Harbor Island. : Coasterra on Harbor Island boasts a stunning waterfront location with views from downtown San Diego to the Coronado Naval Base. The restaurant's contemporary setting and massive outdoor terrace provide the ideal ambiance to enjoy upscale Mexican cuisine. Try Deb's Coconut Margarita and the tableside guacamole before jumping into combination plates such as carne asada and Maine lobster. For dessert, house-made churros with spiced milk chocolate, salted cajeta and strawberry sauces are nice although a bit denser than we prefer.